Experience a fine taste of southern hospitality at the Best Western Plus North Savannah. Our hotel is located just off Interstate 95 and a quick drive to historic Savannah. We are also minutes away from Savannah International Airport, Tanger Outlets Mall, Tybee Island, Hilton Head Island and award winning golf courses. 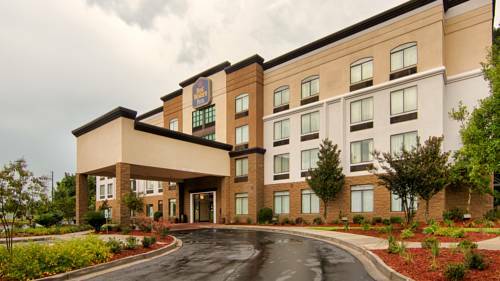 At the Best Western Plus North Savannah, we offer exciting services and amenities that enhance your stay with us. All guests are welcome to partake in a delicious complimentary full hot breakfast buffet each morning. Every room is furnished with cozy Serta beds, 42-inch flat-screen HD televisions, refrigerator, microwave; in-room safe and complimentary high-speed Internet. Our recreation facilities are top-notch, including an outdoor swimming pool and a fitness center. If youre here on business, its a breeze to take care of your work in you comfortable rooms or in our business center. We are also within a close proximity to several major businesses, such as Gulfstream, Citi Trends, Georgia Pacific, Colonial Group, Georgia Ports, and International Paper. Our hotel features 1,189 square feet of versatile event space and can accommodate 123 people for your next conference, meeting or banquet. Whether you are planning a corporate event or a family reunion our hotel has the perfect space for you. No matter what brings you to Savannah/Port Wentworth, count on a reputable 100% smoke-free hotel to provide you with the accommodations you deserve for a competitive price. Book your stay today and discover a new level of Southern hospitality with excellent personalized service. Enjoy your stay. Playground - 8.8 mile(s) from Fun Zone Amusement & Sports Park. Family destination & party venue with mini-golf, go-karts, arcade games & toddler playground. 5.5 mile(s) from Tanger Outlets Pooler, Shopping-mall chain featuring a variety of brand-name & designer outlet stores. 27 mile(s) from Tanger Outlets Hilton Head, Shopping-mall chain featuring a variety of brand-name & designer outlet stores. 8.9 mile(s) from Lummus Corporation, Lummus Corporation is the world s leading supplier of machinery and replacement parts for the cotton ginning industry. ~19 miles from Port Wentworth. ~42 miles from Port Wentworth. ~37 miles from Port Wentworth. ~59 miles from Port Wentworth.